The Holiday Season has arrived and Streamate is offering cammodels an opportunity to earn an additional 30% of money earned. 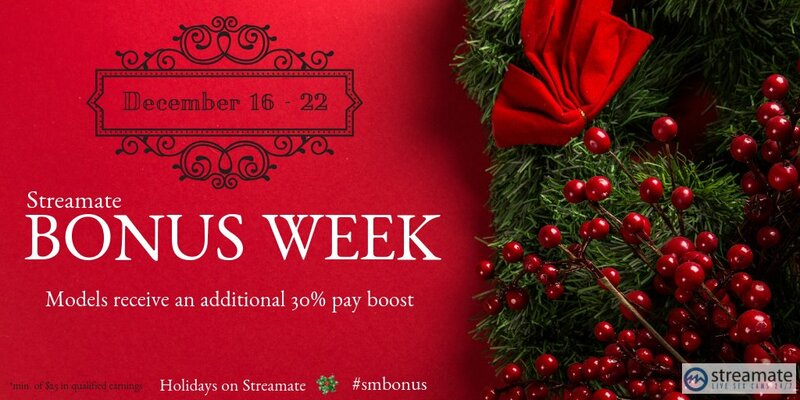 Because Streamate is being so generous and offering cammodels such a great bonus during the holiday season, the Boleyn Models daily pay network has decided to increase that bonus by an additional 5%. In order to receive the additional 5% bonus, cammodels within our daily pay program must participate in our weekly bonus for Streamatemodels. Dec 16-22 (GMT) – For the entire week of Dec 16-22 (GMT), we’re boosting your earnings by 30%! At the end of the week we’ll add up all your eligible earnings. If you made at least $25, we’ll apply a 30% bonus. For example, earning $100 will result in a $30 bonus! One day after the bonus week ends, the December Holiday Contest will run from Dec 24-26th (GMT)! This is a single three-day-long contest. The top 200 performers will earn rewards, with a grand prize of $5000! You can see the countdown to this event on the contest leaderboard (read more on the Contest Leaderboard help page). If you aren’t already a Streamate Model within the Boleyn Models Daily Pay network but would like to be, please take a look at our transfer process. The Streamate Daily Pay Transfer process.